At least 39 people have died, officials said, while rescuers continue to search for any missing people and the injured are brought to hospital. Italy’s deputy transport minister said 20 vehicles were involved in the disaster, as well as buildings below. Photos and video footage on social media showed a huge portion of the bridge missing and rubble on the ground beneath. At least 39 people have been killed after a highway bridge collapsed in the northern Italian city of Genoa, authorities said Wednesday morning. Angelo Borrelli, the head of the civil protection department, announced the latest death toll on Wednesday afternoon, news agency the Associated Press reports. Rescuers worked through the night shifting the huge quantities of concrete which fell more than 150ft onto the ground below in the hope of finding survivors. Officials said earlier on Wednesday that 16 people were reported injured, and at least two were missing. They have not released further figures about the injured and did not say if the latest rise in the death toll were due to the missing people they had identified earlier. Separately, Italian Deputy Prime Minister Matteo Salvini said that three children are among the dead. Fire brigade spokesman Luca Cari said 400 firefighters were at the site, lifting big chunks of concrete so rescue teams could check for survivors. A total of 1,000 rescuers have been working on the scene since Tuesday. At least 20 vehicles were involved in the collapse, Deputy Transport Minister Edoardo Rixi said, and the disaster had affected people in the buildings below. 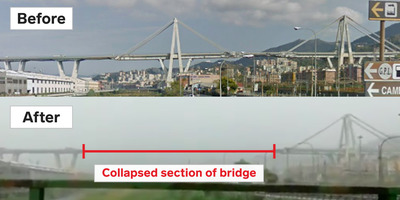 The collapsed Morandi bridge was a section of the A10 motorway, near the city center. The collapse took place as torrential rain fell in the region at 11.30 a.m. local time on Tuesday. The director of the motorway operator Austrade for Genoa said on Tuesday evening that it was too soon to determine the cause of the collapse. Photographs from the scene show rubble on the ground underneath the bridge and a number of buildings underneath it. Matteo Salvini, Italy’s deputy prime minister, said on Facebook that he and other officials were closely monitoring the disaster response. 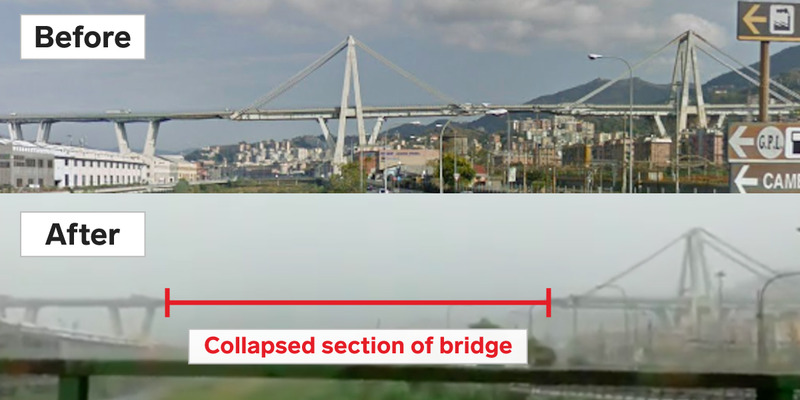 Toninelli said no maintenance work was underway at the time of the collapse and that maintenance was up to date, adding that the government was planning to launch a 20 million euro ($US22.7 million) bidding process for significant safety work on the bridge. Since taking office, Toninelli has asked for updates on the state of all bridges and viaducts in the country. 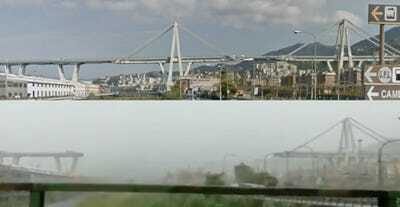 The bridge was built in the 1960s, and restructuring work was carried out on the bridge in 2016, Reuters reported. A structural engineer specializing in bridges says told the Associated Press that corrosion or weather conditions could have been part of the reason the bridge collapsed. An investigation has been opened to determine the cause of the disaster.